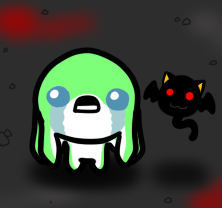 Was playing the Binding of Isaac: Rebirth in the stream a while back when Keco and Insomnicon both turned out these two adorable yet creepy pics! Kecobat familiar is +1 Evil and randomly changes your attributes when the whim takes him. respectively! Go watch the two of them :). Kecobat? Oh dear goodness. "Hey bozz it's bozz rush time! Have infinite health and a blindfold!" Adorable Kecobat minion! And adorable teary-eyed Carmine too.